Almost all Wifi devices and routers in today’s time rely on WPA2 to encrypt wifi traffic. With weak Network Security, an attacker can use Key Reinstallation Attacks (KRACK) and take advantage of a weakness that was discovered with WPA2 and can gain access to private information through your protected wifi devices. This private information can range from credit card information, chat messages, phone numbers, and passwords. 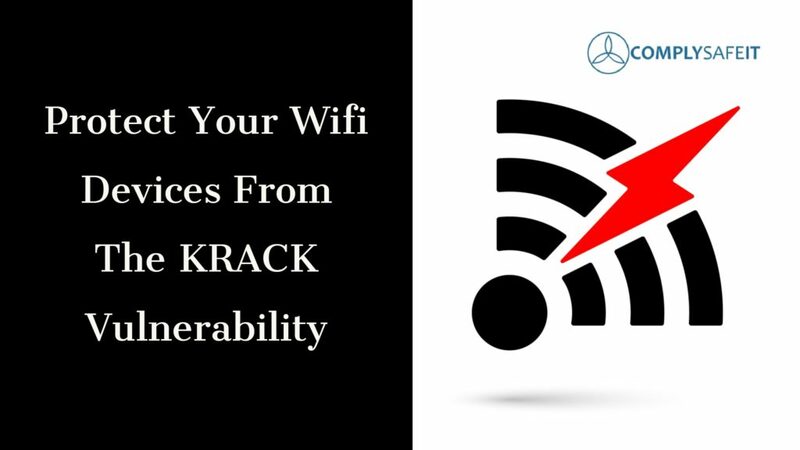 KRACK can work against all modern protected wifi networks. So how can you protect your wifi devices from this attack? Keep reading below. Laptops, Tablets, Cell Phones, Wifi Routers, should all be updated on a regular basis. These updates contain security patches that can help protect against the attacks. These security patches are coming quickly from the vendors. Certain programs will already be protected, such as an updated Windows PC. Updating your router is also important, not just your devices. The firmware specifically will need to be updated by the maker of your router. If the company that makes your router does not make it a priority to update your router, you may need to consider switching. There are several router companies that have acted quickly and fixed the problem such as, MikroTik, Ubiquiti, Meraki, and Fortinet. If a wifi wireless connection can be turned off on your router, you could use an ethernet cable on your laptops to protect them. If you did choose to use an ethernet cable, make sure the wifi on your device is turned off. Obviously, your phones and tablets cannot be connected to an ethernet cable. To protect those devices, you might want to consider turning off wifi and strictly using cellular data. If you don’t have unlimited data or live somewhere with a spotty connection, this might not be the best option. The Electronic Frontier Foundation released a browser extension for Mozilla Firefox, Google Chrome, and Opera called HTTPS Everywhere. This extension makes your browser more secure. Anyone using Firefox, Chrome, or Opera should consider installing the extension. This extension notifies you when you are using unencrypted access (HTTP) and encourages you to use encrypted access (HTTPS) to encrypt your traffic. There are some factors that could make this extension not work, such as your traffic not being encrypted, but it’s better than no protection at all. There are several myths about what can protect your wifi devices and what can’t. Make sure to research before installing anything on your devices and contact your carrier providers and router makers for any questions.